The proposal Friday from the Environmental Protection Agency challenges the basis for the Obama regulation. 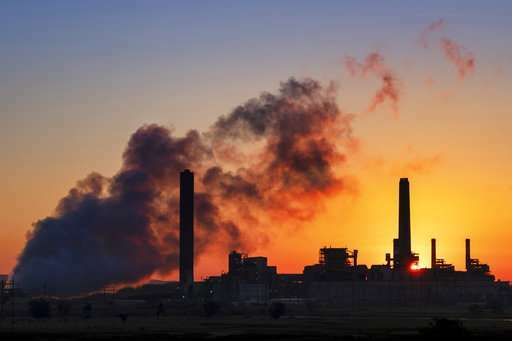 It calculates that the crackdown on mercury and other toxins from coal plants produced only a few million dollars a year in measurable health benefits and was not "appropriate and necessary"—a legal benchmark under the country's landmark Clean Air Act. Coming one week into a government shutdown, and in the lull between Christmas and New Year, "this low-key announcement shouldn't fool anyone—it is a big deal, with significant implications," McCabe said. To remove regulation controlling the emissions of mercury for coal-fired electrical plants is the sickest action taken by EPA administration to date. I've been shocked by a lot of things that have resulted from the Republican assault the environment, but the mass poisoning of millions is borderline criminal. I can only imagine the lawsuits that will occur against the power plants if they don't apply mercury abatement and filtration to the exhaust of coal-fired plants. More mercury. Oh neat. Maybe we can have more lead soon. Careful DS. Remember, the altright fairytails ain't two brite! They all gonna think your suggesting lead bullets! Making america great again, like the good old times. Can we bring back smallpox next? Thats on the Southern border Amoeboid .. Wait for it.. When you vote for the Republican party of death and corruption you get more death and corruption. Yes, absolutely. Give them time. Just keep electing Republicans. Oh come on now. Lead is plant food, and it's time to start burning Cleeeeeeeean Coal. "but the mass poisoning of millions is borderline criminal. " Who cares? Only the inferior class is going to be poisoned and not the superior ruling class whom the inferior classes elected. Besides. Mercury is good for you. There is no scientific evidence that mercury is harmful. Don't fall for the anti-mercury, anti-scientific, communist scam. Mercury is a trace element in the Earth's crust. Hence it can't be poisonous. Mercury is natural so it can't be a pollutant. The attack on Mercury is just a commie plot by the worlds scientists to establish a global, socialist, one world, Communist government as outlined by Q-Anon. Funny but I cant find any studies which show deleterious effects from mercury produced by coal-fired plants, or of how reducing mercury emissions per obama regulations corrects or even affects health. Anybody know of such studies? All I can find is horror stories about minamata, and studies about workers exposed for years at levels magnitudes above the normal environment. This wouldn't be another one of those idiot regulations designed to drive coal plants out of business would it? I mean, perhaps that is a good idea but using phony feel-good regs that cant be backed up with credible data is a very bad idea dont you think? Smallpox on the southern border? The last known natural case was in Somalia in 1977. Since then, the only known cases were caused by a laboratory accident in 1978 in Birmingham, England, which killed one person and caused a limited outbreak. Smallpox was officially declared eradicated in 1979. That is because you haven't looked. For Republicans, keeping themselves ignorant is Job #1. Scott Nudds - master baiter. Sorry no sale. Who did the study which shows how the neurological damage from mercury leads to conservatism? Or it just common knowledge? Sounds like something the Kenyan would come up with. Be aware of the latest Russian/GOP/Fossil lobby/troll-factories troll called @montanaclass. It is obvious and pathetic. Can't those troll factories/lobbyists afford better trolls nowadays? This latest one is particularly 'monomaniacal' insofar as it is here solely to promulgate the troll-factory memes re "the Kenyan" and 'socialists' etc. Even @Uncle Ira's bot-voting and trolling idiocy is (comparatively speaking only, you understand) more engaging/intelligent than what issues from this paid-for Johnny-come-late Russian/GOP/Fossil troll. They are scraping the bottom of the barrel, folks; else it is a cheap-and-nasty' limited-programmed 'chat-bot' because they couldn't afford any better; or someone is 'skimming' from the troll-factory budget (charging their masters full whack for this patently less-than-useless bot and pocketing the difference). Not only are these types stupid, but also too greedy for their own good. Sad. Why you want to make me the miserie here where I never even wrote a message yet? Begging for my attentions Cher? I told you before Cher, everybody gets a vote, even me. I can vote anyway I want to do it and you should not complain for me using it. Maybe you should complain to the nice peoples at the physorg since they are the ones who authorized me to vote. And I told you before that your bot-voting '1's, against posts/posters DESPITE their correctness, is what TROLLS do. So just because you CAN vote, the fact you choose to ABUSE that privilege, by BOT-voting/trolling, is all down to you, Ira. It demonstrates you're a bot-voting/trolling nincompoop trying to get attention from me; and trying to curry favor and '5's from other troll types who are complicit and/or encourage your bot-voting/trolling idiocy because it suits their own agendas. The fact your industrial-strength stupidity/malignancy prevents you from correcting yourself instead of still abusing your PO privileges, tells intelligent PO readers your upbringing/character was/is tragically bad. Sad. Well okay, no problem,,just don't do it anymore. Maybe some other troll/bot/gang will come along to fool around with you some more. I am going to watch a couple of my Leverage videos before I have to get to work.